When Anita Schorr goes out, she is often followed by a young Czech girl. The youth presents herself meticulously when she appears with Schorr, turning out in a smart dress or sharp Alpine ski outfit, her lustrous brown hair neatly combed. The girl has a striking resemblance to Schorr. In fact, the girl is Schorr, albeit in photographs more than 70 years old. In this way, the 80-year-old Westport resident connects with young people at schools, churches and synagogues throughout Connecticut and metropolitan New York as she tells her story of surviving the Holocaust. "My objective is to explain that if you don't watch what happens on the playground, on the bus, on the internet or wherever the mean stuff is happening, it could lead to something like what I went through," she said. 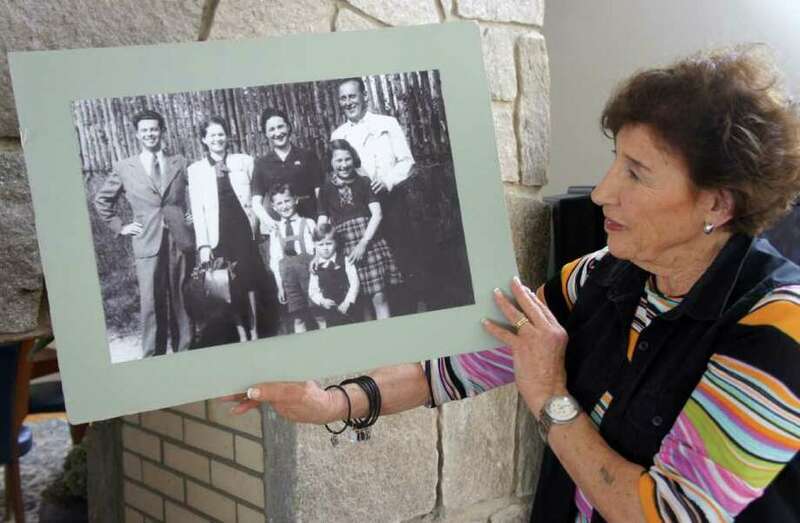 Accompanied again by a photo gallery of her youth, Schorr will appear on Sunday as the headline speaker at The Conservative Synagogue's Holocaust Remembrance Day ceremony. The synagogue's commemoration of the day, which is called "Yom HaShoah" in Hebrew, will begin with a procession of Holocaust survivors and their family members, as they carry two Torahs saved from the Holocaust. "To me, Yom HaShoah is about freedom, survival, the memory of the losses," Schorr said. "By telling my story, I'm immortalizing those who didn't make it." Born in 1930, Schorr grew up in an upper-middle-class family in the Czech city of Brno. Her father, Fritz, worked as a salesman, and the family enjoyed tennis, skiing and opera. But that life began to crumble with the 1939 German invasion of Czechoslovakia and the outbreak of World War II. A year later, she and every other Jewish child were expelled from Czech schools. Then, in 1941, German forces sent Schorr and her family to Terezin, a Jewish ghetto town in Czechoslovakia. "In the time of peace, there were only 6,000 people living there. And when we were there it was more like 50,000 or 60,000," she said. "And we were all infested with lice and bugs because there was no hygiene." That internment would precede an even darker chapter: the deportation in 1943 of Schorr and her family to the Auschwitz concentration camp in Poland. Just shy of her 13th birthday, Schorr immediately was stripped of any vestiges of individuality. Her head was shaved, she was tattooed with an identification number and handed a drab uniform. As she spent her days "drifting" around the camp, Schorr said, the base living conditions tormented her constantly. "The hunger enters your psyche, and you become a hound. You were never full," she said. "They destroyed you mentally with this thing called hunger." Almost a year later, German forces embarked on a purging of the camp population. Able-bodied prisoners were offered forced labor assignments away from the camp. While Schorr was not technically old enough for such work, her mother, Stella, still implored her to leave Auschwitz. "My mother told me, `Tell them you are 18. You are strong. Go.' She pushed me, and she walked away. "I thought my mother didn't love me," Schorr added. "It was a traumatic moment. I didn't realize my mother had done the most heroic thing." As Schorr left Auschwitz, her mother and brother, Michael, were executed in the camp's gas chambers. In Hamburg, Schorr worked as the youngest member of a 5,000-woman forced labor detail. Living in a storage house, she spent each day in the custody of German troops, as she dug ditches for her captors and pulled bodies from bombed-out rubble. In February 1945, she was transferred to the Bergen-Belsen concentration camp as Nazi rule began to disintegrate. A few weeks later, British troops liberated the camp. "The young soldiers came with such a smile when they liberated us," she said. "Suddenly the Germans were all gone. It was so exciting. We were free suddenly." Along with other former camp prisoners, Schorr was moved by Allied forces to a hospital in Hannover to recuperate from her ordeal. There, she soon received an elating message: Her father, who had been transferred out of Auschwitz, was alive and would reunite with her in Prague. "From that moment on, I was in heaven, she said. "And then I came to Prague, and I was told he was shot [by German forces] two days before the end of the war." Without family, food or a home, Schorr eventually found refuge in an orphanage. She then began to reconstruct her life, as she enrolled at a private art school and learned English. She supported herself financially by working for a local tailor. "I had to humble myself in many ways," she said. In 1946, as Israeli statehood loomed, Schorr moved east to what is now Slovakia to join the Haganah, a Jewish military organization. At 15, her membership in the group mostly consisted of pursuing academic studies, not training for armed combat. After two years with the Haganah, she immigrated to Israel in 1948. "I needed to do something positive," she said. "I came to Israel, and it was a dream come true. There I healed myself to be a person again." Schorr lived and worked on a kibbutz near Israel's border with Jordan. During that time, she also married and had a son. In 1959, she immigrated to the U.S., first living in Yonkers, N.Y. and later Manhattan while establishing herself as a commercial artist. In 1985, Schorr moved with her second husband, Harold, to Westport. Schorr's second career as a public speaker only emerged after years of near-silence about her experiences during the Holocaust. "I didn't want to talk; I was locked," she said. "I just wanted to be like everyone else." But a 1993 visit to the then-new United States Holocaust Memorial Museum in Washington, D.C., changed Schorr's perspective. "That was a turning point," she said. "When I went there, I said to myself, `You've got to do this.'" Since then, Schorr has addressed thousands during her ongoing speaking tour. "We [Holocaust survivors] used to say, `Never forget,'' she said. "But I say, "Remembering is not enough. We need action. We have to start fighting for a better world." Schorr's story has also had a powerful impact on The Conservative Synagogue's Rabbi Jeremy Wiederhorn, who has visited several concentration camps. "From Anita, I have learned that the power of the human spirit can conquer all," he said. "My hope is that the community, and especially the young people, will be able to say to their children, `I met a Holocaust survivor, and I heard her story firsthand. Don't ever let anyone tell you it didn't happen.'" Schorr does not belong to a synagogue, but describes herself as "spiritual." That belief, she said, helped her to endure the darkest moments of her life. Now, it motivates her to share her life narrative and message with children the same age as the Czech girl in her pictures. "I have perseverance in every thing that I do," she said. "And now I have even more perseverance because I've found that I have a voice."